Look your youngest in 7 days with the newly improved Nutox Advanced Serum Concentrate that delivers visible anti-aging skin benefits in shorter time! The wait for a fast-performing anti-aging beauty serum is over. The new and improved Nutox Advanced Serum Concentrate is here! Housed in its signature red bottle, the elixir works diligently to speed up production of skin’s natural collagen, elastin and hyaluronic acid levels to reveal visibly-younger skin in just 7 days! Christine Law, Skincare Marketing Manager of Tohtonku Sdn. Bhd. provided the background to the newly-improved Nutox Advanced Serum Concentrate. “When it comes to skincare, the modern Malaysian woman is well-informed about her choices. She’s smart, savvy and only wants solutions that give her real results. Equipped with consumer understanding and innovative science, Nutox has been providing her with effective skincare products that promise visible results,” she said. 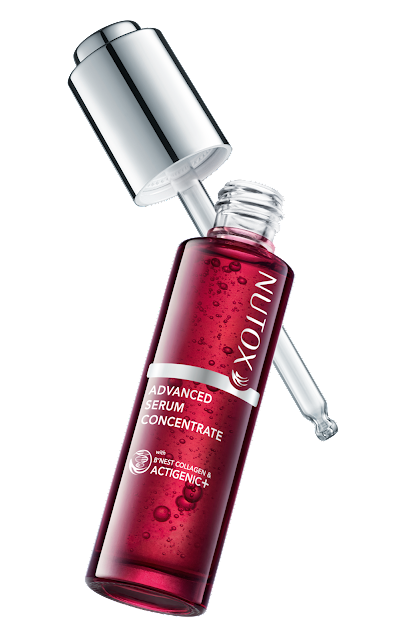 In 2006, the company introduced Nutox’ now-bestselling anti-aging serum, Serum Concentrate. It quickly became a popular choice among women looking for an effective anti-aging solution to address skin concerns such as wrinkles, loss of elasticity and firmness. The signature RED BOTTLE - get younger in just 7 DAYS! “Interestingly, our consumer research has shown that a majority of Malaysian women do not take any preventive measures despite their desire to obtain wrinkle-free, firm-looking skin. 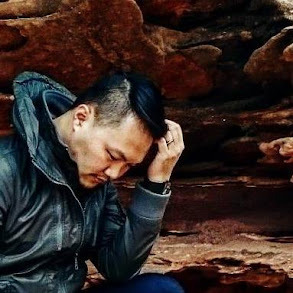 They only start to take action when the signs of ageing become visible on their skin, leading them to have extremely high expectations when it comes to the efficacy of their skincare products,” said Law. In line with this finding, Nutox has taken the initiative to develop its anti-aging skincare range even further, improving the products’ efficacy to deliver visible results within a shorter duration while retaining their affinity with the skin. Infused with Bird’s Nest and enhanced with Actigenic+ Technology, Nutox Advanced Serum Concentrate is formulated to dramatically reduce the effects of aging like fine lines, wrinkles, and loss of firmness. Harnessing the powers of Macro Algae and Indian Gentian Extracts, Actigenic+ is an epidermis regeneration system that significantly firms up the skin, resulting in a more youthful complexion. How does Nutox Advanced Serum Concentrate work? This new and improved Advanced Serum Concentrate with Actigenic+ replenishes and reactivate the production of collagen and elastin in as early as 7 days. Skin is firmer and more lifted in just 7 days. With continued use, see even more improvements on the 14th and 28th day including smoothen skin texture and further visible reduction of fine lines and wrinkles. 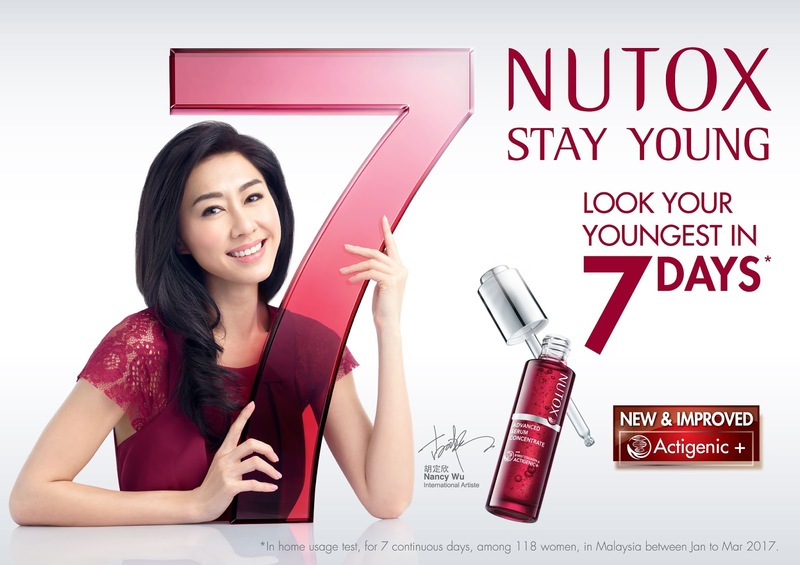 The results speak for themselves; 118 Malaysian women who have tried Nutox Advanced Serum Concentrate agreed that they look younger in just 7 days! 98%* of women noticed lesser appearance of wrinkles and smaller pore size, while 97%* also said that their fine lines became less pronounced. With Nutox Advanced Serum Concentrate, skin texture becomes smoother, skin feels firmer and more lifted, the complexion is brighter and healthier-looking, and the appearance of fine lines and wrinkles are visibly-reduced. Nutox ambassador and international artiste, Nancy Wu shared her love for the newly-improved Advanced Serum Concentrate: “It’s no secret that I’m in my 30s, and while I am very comfortable with my age, I love what I do and I want to keep acting for as long as I can! For Nur Fazura, Nutox ambassador and international artiste, the new Advanced Serum Concentrate by Nutox has exceeded her expectations. “I was pleasantly surprised to notice that my skin is firmer, and my fine lines have lessened! It’s just unbelievable – I think I have never looked younger and in just 7 days!” she exclaimed. “These days, when I look in the mirror every morning, I feel empowered because day after day, my skin continues to look better. I feel that over time, everything in my life is improving, including my complexion. Thank you Nutox for creating the Advanced Serum Concentrate; it’s an amazing product! I think every woman should definitely have a bottle at home or in her bag,” continued Fazura. New & Improved Nutox Advanced Serum Concentrate which is only RM79.90 for 30ml - which is pretty much a deal for me! To look your youngest in 7 days, try Nutox Advanced Serum Concentrate (RM79.90, 30ml), now available at all major pharmacies, supermarkets and hypermarkets nationwide. For more information, follow Nutox Malaysia on Facebook. *In a home usage test, for 7 continuous days, among 118 women in Malaysia, between January to March 2017.